Singapore's equatorial climate is warm and humid, with an average daytime temperature of 31ºC and a minimum average of 23 ºC at night. The country experiences two annual monsoon seasons from December to early March and from June to September. The total population of Singapore is 5.312 million (2012 data) of whom 3.285 million are citizens while the rest are permanent residents, foreign employees or students (approximately 1.4 million). Hence, more than a third of the population is from abroad. As in Malaysia there are three major ethnicities. 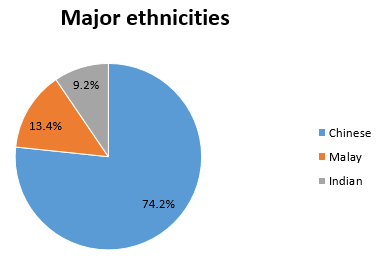 Those comprise of Chinese (74.2%), Malay (13.4%) and Indians (9.2%). However, even though the most of the people consider themselves Chinese, English is one of the most important languages and is especially used in business, government or in schools. In case there are any certificates in Tamil, Chinese or Malay they have to be translated in order to be accepted for submission. 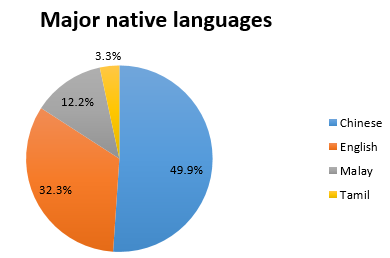 Interestingly, 20% of the population is not able to speak English. However, Singapore’s government is trying to encourage the learning of English. As in Malaysia “Manglish” is a socially accepted medium to talk, many Singaporeans use “Singlish” for everday-talk. It is based on words from English, Malay, Hokkien, Teochew, Cantonese and Tamil. Influences from Australia and Europe are rounding up the local slang even though the government as well as the upper class are heavily discouraging the use of “Singlish”. The small country at the south border of Malaysia is known for its high standard and safety regulations. There are many little things that are said about Singapore, i.e. if you chew a gum you get fined highly. Indeed, in 2004 a law was passed because the gums are littered in public places and not disposed in an orderly manner. Additionally, if you jaywalk or smoke in public place you’re also fined highly. Nevertheless you can always rely on the safety. The rules, the strict regulations make the country one of the securest places on earth. In case you are keen walking through dark areas in the middle of the night, don’t be scared. People won’t mug you because safety cameras are nearly everywhere and the strict safety regulations and punishments on such kind of behaviour won’t make it worthwhile for anybody to steal something from you. Even though this seems like a place where no pickpockets exist, be careful! There are some cases of stealing. When Singapore gained its independence from Britain in 1965, it was a poverty-stricken place with few natural resources. It had a population of warring ethnic and religious groups that was largely uneducated, and many of whom were malaria stricken or opium addicted. Today, it is a gleaming global hub of trade, finance and transportation, one of Asia’s great success stories. Partially this could be achieved because the government realized that the only valuable resource is the people. Thus, humongous investments were allocated in education and the foundation for a future finance hub was laid. As night falls, Singapore takes on another persona to offer a vibrant array of nightlife and entertainment choices. There are nightclubs for the party hedonists to revel the night away; bars and lounges for the thirsty hippos and chill cats; and live entertainment venues for the livewire revellers. In places like the Velvet Underground, Zouk, the Shanghai Dolly, Phuture, Home Club, Acid bar, etc. you’re able to dance and have fun with your friends until late in the night. In case you’re less interested in dancing and you prefer a place to hang out, chill with your friends or knock back a few pints places like Long Bar, Boulevard, Brewerkz, Barossa might be right for you. In case you have the opportunity to stay in Singapore for longer you might be able to experience one of the public holidays. Totalled up there are exactly eleven of them, all originating from different religions and cultures. They include the Chinese New Year, the Buddhist holiday Vesak Day, the Muslim holidays Hari Raya Puasa and Hari Raya Haji, the Hindu holiday Deepavali, and the Christian holidays of Good Friday and Christmas Day. Additionally there are three public holidays that are not associated with a specific ethnic or religious group: New Year’s Day, Labour Day and National Day. Singaporeans participate in a wide variety of sports like football (soccer), cricket, rugby union, swimming, badminton, basketball, cycling or table tennis. It is quite common that public residential areas provide amenities including swimming pools, outdoor basketball courts as well as indoor sport centres which provide facilities for badminton, squash, table tennis, american football, gymnastics, indoor basketball and volleyball, among others. Singapore is surrounded by water and has an average temperature from 24° to 32°. Hence, people enjoy water activities that include sailing, kayaking and water-skiing. There are also a number of avid recreational scuba divers and you might find amazing places like Pulau Hantu, known for their coral reefs.